I was pretty excited when I picked up my 2011 Chevy 3500 dually as it certainly was a beautiful and very capable new toy hauler tow platform. I knew Chevy had essentially replaced everything with an entirely new running gear for 2011, but what I didn’t realize was that my current 5th wheel hitch was not going to bolt onto the newly designed box section frame. The dealership I purchased the truck through had agreed to have my Hitch swapped into the new truck, but the trailer store they sent me to just wasn’t on the ball about solving my issue, so it was back to the drawing board for a solution to my problem. From past experience I knew exactly who to call and that was Larry Reynolds at the Hitch House in Stockton California. Larry had hooked me up with my first 5th wheel setup and I found him to be a real knowledgable pro and an absolute pleasure to work with. Surprisingly what I did find out from Larry was the manufacturer of my old hitch had not yet released a bed rail kit to accommodate the 2011 Chevy Frames. Estimates were 90 days down the road and I just couldn’t be without my 5th wheel Toyhauler for half of the new riding season. 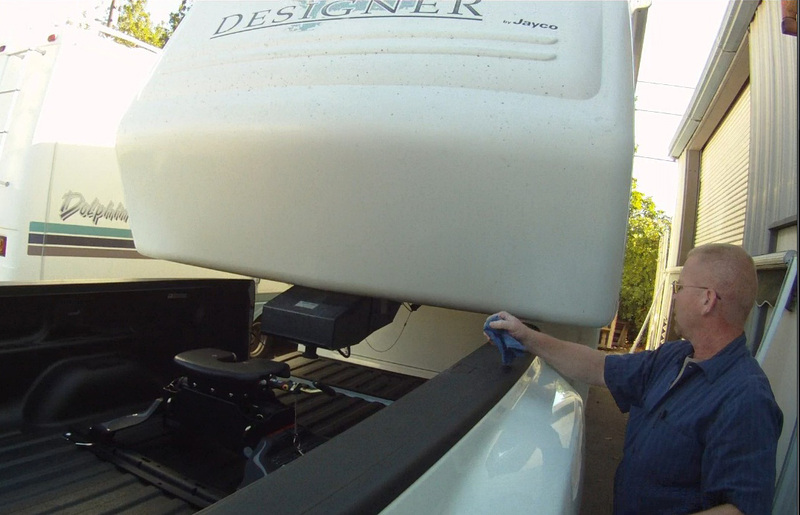 Larry suggested I take a look at the new 20K Q5 Fifth Wheel from Curt Manufacturing that he was very impressed with. The Q5 kit was available, would work on the new 2011 Chevy frame, had a pretty impressive list of features and was listed at a very reasonable price. We setup an appointment to do the hitch install for the following weekend and I felt on my way to solving my unexpected predicament. I showed up bright and early at the Hitch House and my new hitch was waiting for me in the shop. It is a very nice looking unit with a durable powder coat finish that would certainly last better than the paint my old hitch came with. Before I knew it my truck was on a hoist and the guys were busy hooking everything up. I felt a whole lot better about having these trained technicians handling the install as opposed to tackling the job myself. 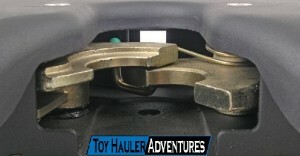 Once the hitch was installed Larry walked me through the basic latching and unlatching steps for the Q5. Immediately I was smitten with the Curt 3 point indicator system, which uses a color coded indicator on the arm of the hitch to indicate which position the hitch jaws are currently in. No more guessing required, just take a look at the indicator color and you know exactly where your hitch jaws are. Satisfied I had a good understanding of how to work the hitch; Larry sent m on my way ready to hook up to my hauler confident I had the truck and hitch ready for the job. The first trip out I was absolutely dumfounded at how easily and smoothly the Curt Q5 and kingpin on my trailer mated. No more banging into place and getting out to see if the jaw had gotten far enough around my kingpin, only to have to pull out and try again. I had just eased the truck back ever so lightly and the indicator color was telling me I was securely hooked up. I was sure there must have been some type of mistake, so I got out and visually checked the hitch jaws and sure enough they were in fact correctly locked in place. Since then although I always do the visual and pull checks, hooking up has been just that simple, line up and gently lock into place. Towing I found the hitch to be very quiet and smooth. I have absolutely no complaints about hitch performance on the road, it’s smooth and absorbs road irregularities with a quiet ease. I Love this hitch! Great story Bob! This is a great hitch! Keep up with CURT on facebook @ http://www.facebook.com/curthitch and with great towing related tips and tricks at http://www.hitchinfo.com . Santa – I need one of these!